Today my guest is Geoff Redknap. He is a writer/director with an extensive background in effects and makeup. Some of his credits include Deadpool, The X Files, Cabin in The Woods and The Watchmen. I had him on to talk about his feature length debut, THE UNSEEN. 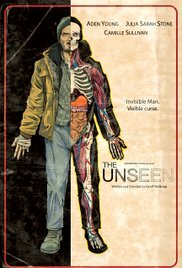 With a decidedly different take on THE INVISIBLE MAN, THE UNSEEN is one of the highlights of this years Fantasia Fest.